The Cheney Brothers National Historic Landmark District was established in 1978 through a designation by the U.S. Department of the Interior and is listed in the National Register of Historic Places. The District extends for about 1.25 miles from east to west and about 0.6 miles from north to south and covers approximately 175 acres. It encompasses all of the existing Cheney Brothers silk mills, the 1785 Cheney family homestead, several 19th and 20th century mansions built for the Cheney family, schools, churches, and halls built by Cheney Brothers for their employees, and over 275 residential structures built for company workers and their families. The Cheney Brothers National Historic District Commission was originally established to initiate a study for the rehabilitation of the mill complex. It has evolved into an advisory group to the Town of Manchester and also advises property owners in the District on appropriate renovation and restoration of structures in the District. Info about the Commission on the Town's web site Commission. To view a map of the Cheney Brothers National Historic Landmark District, showing the location of the properties and providing links to information on many of them, click here: Historic District Map. NOTE 1: Other pages in our web site discuss the Cheney Bros. silk operations, such as the "Cheney Silk" Image Collection and the above Historic District Map. You can also visit the "Cheney Brothers Silk" section of the www.textilehistory.org web site, by clicking here for more information. NOTE 2: A comprehensive description of the Cheney Brothers National Historic Landmark District, its history and its sites, quoting from the nomination for Landmark status, can be found in the "Living Places" website, by clicking here. NOTE 3: The 45-page form nominating the Cheney Brothers Historic Distrcit for inclusion in the National Register of Historic Places can be found by clicking Nomination Form. NOTE 4: A group of 12 photographs accompanying the Nomination Form can be found by clicking Nomination Photos. NOTE 5: After the Landmark District received its designation, a Plan of Preservation and Development was published. It includes photos and a summary of the history of the District and its sites, with ideas on how to re-use the mill buildings and preserve the historic area. Many of the mills did become apartments, as envisioned in this April 1980 report, sometimes known as "the blue book." The 93-page booklet may take considerable time to download. Click Preservation Booklet. The first mill was built prior to 1838 along Hop Brook, and originally was a grist mill. In 1838 it was converted to the production of silk. Subsequent mills were constructed along the brook to the south of Hartford Rd. None of these early wooden mill buildings still exist. After 1872, as steam power was employed and reliance on water power diminished, mill buildings were constructed north of Hartford Rd. away from Hop Brook, beginning with the Spinning Mill (now referred to as the Clock Tower Mill). Additional buildings were constructed through 1917 as the company's fortunes prospered. The overall appearance of the mills have changed little since 1920, with the exception of the Printing Plant which was built in 1946 directly behind Cheney Hall. Most of the mill buildings (except for the Printing Plant) are classic examples of standard timber and brick mill construction of the early 1900's. Although they are not ornate, there is a touch of architectural embellishment to the functional structures, where efficiency and cost were a prime consideration. The architectural touches include corner pilasters, corbelling at the cornice lines, and well-designed entrance pavilions. Many of the buildings have been converted to apartments. However, there are still out-of-the-way corners of the District where some of the more interesting structures still stand, such as the three story silk vaults, the train car security shed, and the former public bath house. 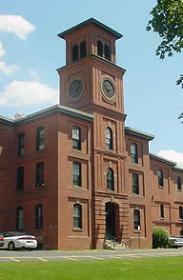 A collection of Cheney mill employer information is available at the Thomas J. Dodd Research Center at the University of Connecticut in Storrs. For an online list of documentation click on Cheney Collection at the Dodd Center. Researchers would then have to visit the Dodd Center to review the material. To view a reprint of a short history of the Cheney Brothers silk mills complex on this web site, please click here: Cheney Mills reprint. Unlike many other New England mill owners in the 19th century, the Cheneys did not build elaborate estates in places such as Newport or Saratoga, which were far removed from their mills and factories. Instead they chose to build their homes next to their factories in a park-like setting of trees and lawns that was contiguous throughout the mansions, mills, Main St., and workers housing areas of South Manchester. Today, this area is little altered and covers about 70 acres along Hartford Rd. and Forest St. The major landscaping element is a "Great Lawn" at the center around which the 13 Cheney mansions are placed. The value of the total assemblage is far greater than the sum of the individual components, and it represents a unique example of the owning-managing family-in-residence concept that contributed to the social as well as financial success of the company. Two early mansions designed by the noted architect Stanford White, have been demolished. Several extant houses were designed by Charles Adams Platt, one of the leading American designers of country estates and large houses surrounded by formal gardens in the early part of the 20th century. Platt was the son of Mary Elizabeth Cheney, and is perhaps most famous for the Freer Art Gallery in Washington, D.C. 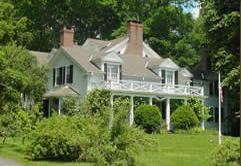 The houses designed by Platt are at 40 Forest St., 50 Forest St., 20 Hartford Rd., and 151 Hartford Rd. All of the Cheney mansions are privately owned, however none are currently owned by Cheneys. To make good on their promise of improved if not idyllic working conditions, Cheney Brothers entered into the housing market to provide adequate living quarters for their new employees. In 1875 Cheney Brothers acquired several existing single-family homes and built a considerable number of new single-family residences on School and Eldridge Streets, east of Main St., most of which remain. The company owned approximately 200 rental units by 1896, with steam heat, gas and electricity provided to tenants at low company rates. Rentals varied from five to twelve dollars a month, depending on location. From the beginning of their involvement in the housing industry, Cheney Brothers preferred and encouraged their employees to purchase their rental units "on reasonable terms when they had become established in the mill." The company made long-term mortgage loans for such purchases. The company also disposed of vacant house lots at the rate of one to two cents per square foot. By the start of World War I, Cheney Brothers owned 275 workers' houses, located to the east, north and northwest of the mill complex. Company carpenters, plumbers, electricians and painters maintained all the company-owned residences at no charge to the tenant. The houses were built in a variety of architectural styles current at the turn of the century. Popular designs included the simple vernacular cottages east of Main St., the Arts and Crafts Movement and Craftsmen styles north and northwest of the mills and Eclectic cottages and bungalows to the west. The quality of construction and landscaping remained consistently high, reflecting the company's desire to create an efficient, content labor force and a supportive community. The company role in housing ended with the fall of the silk empire in the early 1930's. During September 1937, 248 residential parcels with a total of 747 dwelling units (not all within the Historic District) were sold at auction. Sixty- one parcels were purchased by tenants and an additional 33 units were acquired by a single buyer who continued the policy established by Cheney Brothers of encouraging tenants to buy their units. Today, over 80% of the residential structures in the District are owner occupied. Detailed information on the Auction can be found in this web site by clicking here. The District is home to several cultural institutions representing performing arts and history and house museums. Cheney Hall which was built in 1867 by Cheney Brothers as a meeting facility and social hall, now functions as a venue for meetings, theater, entertainment and social events. The Cheney Homestead, where the brothers who began the silk business were born and raised, is now a museum open to the public. The 1751 one-room Keeney Schoolhouse has been recreated on the grounds of the Homestead and is also a museum. The Fire Station built by Cheney Brothers in 1901 to protect the mill complex and surrounding areas is now home to the Connecticut Fireman's Historical Society and a museum dedicated to preserving the State's fire history. The Cheney School built in 1859 is now the home of the Manchester Historical Society's Old Manchester Museum of local history. The Manchester Historical Society periodically gives walking tours of the Cheney Brothers National Historic Landmark District. Please check this web site's Upcoming Events page for information on the next Tour. A two-page printable walking tour brochure, developed in the 1980s and 1990s by Manchester Community College professors John Sutherland, Tom Lewis, and Sylvian Ofiara, is available by clicking: District Walking Tour. The illustrated brochure includes a map.